This oceanfront complex is an excellent vacation base, within an hour's drive of Central Florida's attractions and 20 minutes from Kennedy Space Center. Also minutes away are eight golf courses. Resort amenities include complimentary first-run movies, cable television, a heated pool, and gas grills at poolside and on a rooftop party deck. Seagull furnishes equipment for surf or pier fishing, golf clubs, and bicycles, too. Airboat tours and deep-sea fishing excursions can be arranged. 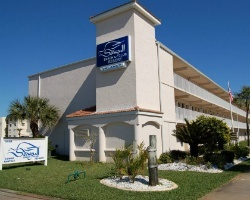 Rare resale opportunity at this lovely Cocoa Beach resort!